Remove the drop-ceiling in the kitchen or Total bathroom/laundry renovation. Let’s look at the kitchen ceiling first. The late 1950s brought many changes to this house. The then-owners wanted a cozy kitchen in the style of the time, meaning dark wood cabinets, loud wallpaper and inset flourescent lighting. And of course, a lowered ceiling. 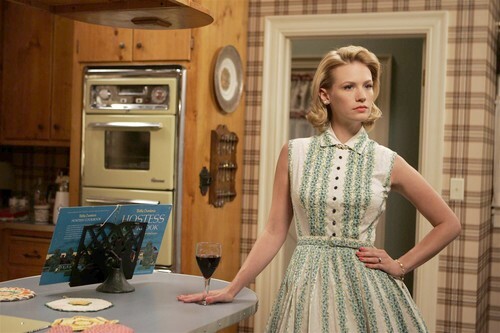 Have you seen Betty Draper’s kitchen? It was a lot like that. Click through for the breakdown and pics! That’s great if that’s your thing. If this were a ranch house or even a bungalow I could see it, but it’s not, it’s an 1890s victorian. We’ve done a lot to make the kitchen look bright and airy (I’ll save that for another post), but the ceiling remains. Look! They just covered right over the tall window! There are perfectly reasonable 10-foot ceilings up there! Admittedly, we’d have to re-do the old ceiling because they pierced the plaster with beams to hang the lower ceiling from. I’m okay with that. But it’s not just aesthetics that fuel this project. 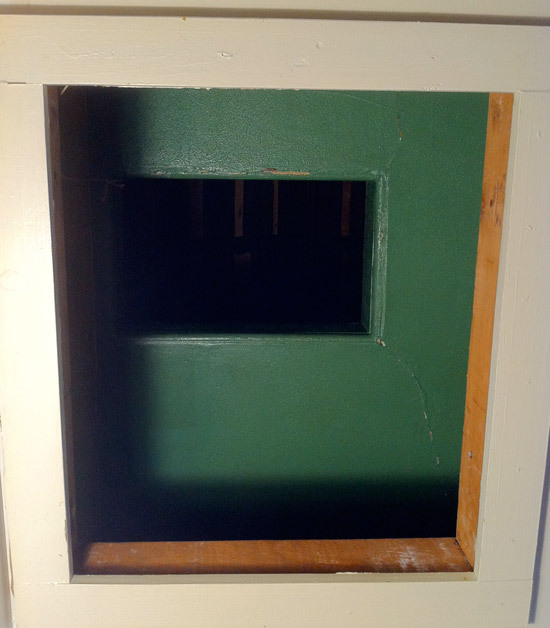 Our only attic access is through two kitchen ceilings, and we just can’t make it work with a ladder and two levels of access holes, one of which (the hard to reach one) is about 12 x 18 inches. We’ve lived in this house for more than two years and we’ve never been in the attic. We’ve never seen the wiring (I suspect there’s some linen-wrapped knob and tube action), and we’ve never checked for roof leaks. I know a little squirrelly person could get up there, but I can’t. This project would make for a very dirty kitchen for the duration. We would do most of the demolition ourselves and we’re not sure what we’re going to find that needs correcting up there. Still, it’ll be a much faster project than the bathroom. Now the bathroom. Again, the 1950s are proudly reflected here. Actually the look of it is kind of great – pink and black and chrome. But even if we wanted to keep it looking as is, it would require a total overhaul because it’s all starting to fall apart. There’s a leak from the bath pipes to the basement that we haven’t been able to isolate (we tore out part of the ceiling in the basement and put a pail there that remains to this day). It’s causing the subfloor of the bathroom to warp and swell. On top of that is really ugly modern vinyl flooring. There’s a window but no airflow and that makes for a lot of mildew. The tile grout is giving up this mortal coil, the sink and tub are worn away and porous and consequently always look dirty. 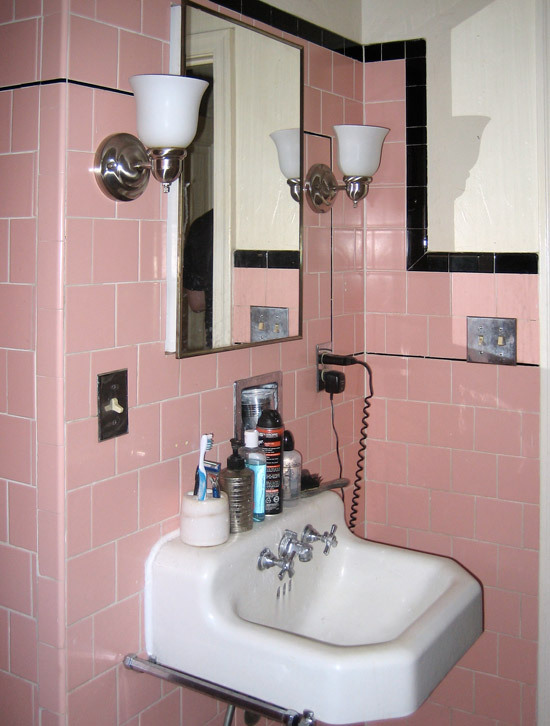 It’s a 60-year old bathroom and I for one don’t want to think about all the people who have used it. 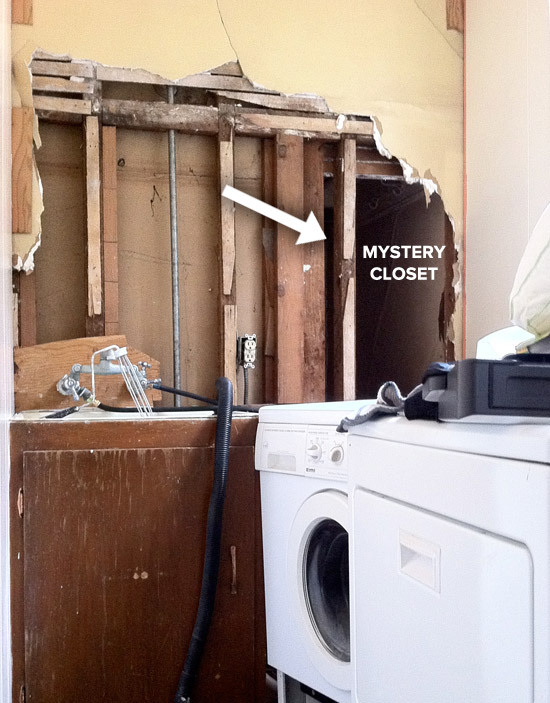 And there’s more: behind the bathroom wall is an awkward laundry room and a WALLED-OFF CLOSET! That’s right, 10 square feet of unused floor space SITTING THERE EMPTY AND INACCESSIBLE. In fact everything you see here in yellow is currently unusable space! 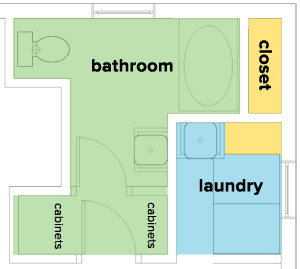 We would combine all of this and put the laundry in a closet in the bathroom. If we tackle the bathroom it’s going to be long and expensive and we’ll have to install a shower in the basement bathroom to make it work in the meantime. It’s going to cost a lot, but in the end it’ll be beautiful and add to the value of our house. Obviously they’re both expensive projects, the bathroom much more so. But let’s put finances aside for a minute. Opinions? Advice? Have at it! Wow! That is a tough call. Both projects sound exciting! If you did the ceiling first, how long would the bathroom wait? Is there much danger of water damage from the leaky plumbing? As someone allergic to mold and mildew, I’d want to get that out of the bathroom. Then again, the attic access seems pretty key for safety too. I guess I’m not much help, but I hope you keep us updated on the process! The bathroom is going to be a big hunk of cash, so it may have to wait regardless. The water leakage in the bathroom was a big concern for me, but with the basement ceiling open It’s not going to do any irreversable damage to the under-floor. The thing is, if I do it, I want to do it right, not with fixtures from the Home Depot’s Landlord Special, so it’s going to take some detailed planning and budgeting. Yeah, tough call, but I’d have to say the bathroom. The unused space aspect is nuts, although I know you have lots of basement space as well, so that may not be the most pressing aspect. And the general mildewy, leaky grossness is also a safety issue, as well as a quality-of-life one. It sounds like that’s more pressing. I totally hear you on the ceilings, though. Our Victorian upstairs flat doesn’t have an attic, but I know that our living-room ceiling was obviously lowered at some point, because the molding over the front door gets cut off conspicuously, and it’s way lower than the ceiling in the adjacent front room. Yeah, I’m really not into the gross factor. It’s put me into a state of denial about having a bathroom at all. I don’t want to clean it and I will never bathe in the tub itself, so in a way it’s becoming less functional for me as time goes on. I do not understand the lowering of ceilings. It can’t be cheap to do, and the heating issue would probably be better addressed through windows and insulation. Thanks for the input. Hm, my long previous comment didn’t seem to stick! Start with the bathroom. I did that in my own house and frankly, a person spends a lot of time in the bathroom. Gives time to think about an even more perfect kitchen, AND good to take care of leaky things first! Although I am insanely curious about what’s up there in the attic, I would have to say the bathroom project. The one caveat is that you mentioned attic insulation. I suppose there is no insulation up there? or mystery insulation? That is a mystery that could cost a lot of money it seems, and might make the bang for the kitchen buck more than the bathroom buck. I didn’t make this clear, but we have *looked* into the attic. If you stand near the top of a ladder, you can get your head and arm in far enough to shine around a flashlight. There’s no dead bodies that you can see from there anyway. And no, no insulation. Brrr. Josh might be right, maybe there is a way we can re-cut the hole for access while we save for the bathroom. I would take care of the bleeding first. The leaky bathroom stuff. Mold build up etc. 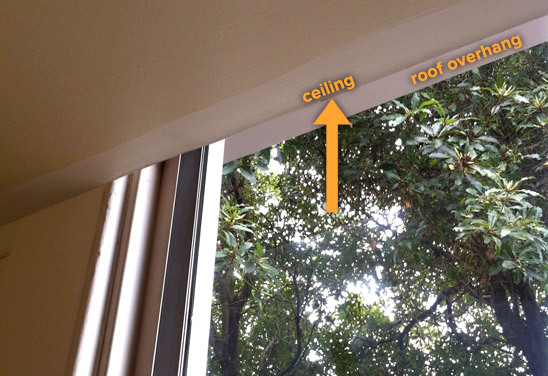 Widening the access port into the ceiling could be a fast way to get up there and take care of wiring inspection. My 2 pennies. You may be right, we can probably widen the access. We haven’t figured out how to do it without the risk of cutting into a load-bearing beam or something, so it’s probably time to consult a professional. Tina, your bathroom is beautiful! It didn’t look bad before either, but I could see why you’d want to be rid of a black toilet. It looks much larger and warmer now. Our kitchen is totally livable as is, so maybe we can figure out another way into the attic while we save for the bathroom. 2) Water damage in the bathroom is a Bad Thing and will only get worse with time. Better to tackle it now. 3) Once it’s done a new bathroom will improve your everyday life in the house, as well as increase resale value. Thanks Gina! You guys are all talking sense.